Earnings Per Share – In terms of earnings per share, AMZN disappointed investors. While analysts expected to see the company generate earnings in the amount of $1.56 per share, the company actually produced earnings more than 30% below expectations at $1.00 per share. Revenue – Unfortunately for AMZN, top line revenue also came in well below expectations. In the quarter, analysts expected that the company would generate $35.93 billion per share. Unfortunately, AMZN generated $35.75 billion in top-line revenue in the quarter. Is Amazon Destined To Continue Falling? Following earnings, AMZN fell dramatically in value. In fact, the stock has dropped more than $150 per share in the past couple of weeks. So, is Amazon destined to continue falling? In my opinion, the answer is no! In fact, in this particular case, it’s relatively easy for me to look past the negative earnings report. Here’s why I have such a strong bullish opinion of what we can expect to see moving forward. AWS – First and foremost, let’s chat about AWS, also known as Amazon Web Services. AWS is a cloud based service used for storing data, hosting websites, apps, and more! More importantly, the product is growing incredibly quickly in popularity. In fact, when we first heard about AWS in early 2015, AMZN announced that it had already grown to be a $5 billion company. This is huge, considering the massive growth we’ve seen in the industry. At this rate, AMZN is in the lead in one of the fastest growing emerging markets that ever existed! Amazon’s Infrastructure – Another reason my opinion of AMZN is so bullish is the company’s infrastructure. In late 2014, Amazon started to spend massive amounts of money on infrastructure. In fact, the company was spending so much money that investors started to get concerned and the stock started to fall in value. However, at this point, these investments are starting to pay off in a big way. As more and more consumers shop online, one of the biggest driver for these consumers to chose one website over another is shipping times. Because of the vast infrastructure that AMZN has created, it logs the fastest shipping times among online retailers as a whole. This will help Amazon to solidify its leadership role in online retail! Amazon Prime – Finally, Amazon Prime is likely to be another big driver of growth for the stock. While at $99 per year per account in exchange for free shipping, streaming video and more seems like a loss, the details are shocking. A large percentage of Prime members spend more than $800 per year or more at AMZN. That’s a huge number that will lead to huge profits. Is Now The Time To Invest In AMZN? While I have an overwhelmingly bullish of what we will see from AMZN in the long run, my short term view is a bit different. The reality is that investors move the market, and investors are currently afraid to move the needle up on AMZN. So, I’m expecting further declines on the stock in the near future. However, soon it will reach support. I’m expecting for this to happen around $430 per share or so. Once it reaches this point, chances are that it will be an incredibly good time to buy! Where do you think AMZN is headed moving forward? Let us know your opinion in the comments below! 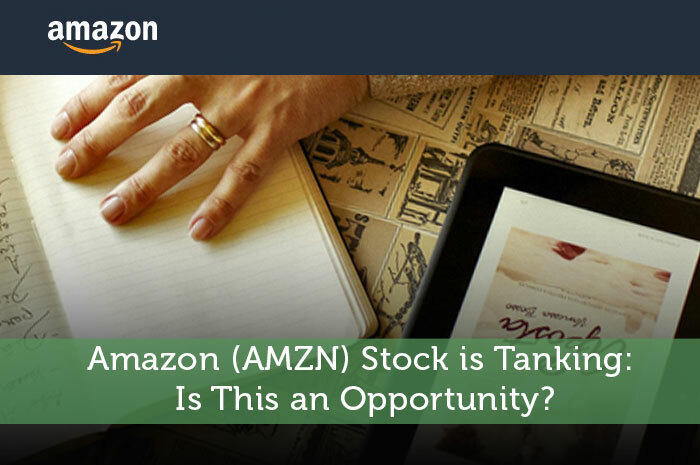 Amazon (AMZN) Stock is Tanking: Is This an Opportunity? You are wrong on all three points. Unless amazon changes it’s ways they will continue to decline. 1) Web services is just another version of .com except worse. Initially it may make money, but when people realize what a scam and how insecure online storage is, everything will come back in house. This is also why Windows 10 will fail if it goes SaaS. 2) unfortunately amazon hasn’t learned the rule, if it aint broke don’t fix it. It is a HUGE mistake for amazon to use USPS as their carrier. That would be like sony putting all of it’s new releases on Beta max tapes, Enough said. 3) I am one of those prime members that did spend much more than 800 dollars a year on amazon, but since the product gets so mistreated by USPS and costs me more time trying to figure out when or if my package is actually going to arrive, I am canceling amazon prime and shopping locally or from dependable online stores. Also, there are many streaming services that are far superior to amazon prime. research and you will see there is much more empirical evidence to support everything I’ve listed (including amazons plunging stock).